You’ve been there before. Another two-hour drive on Highway 316 from Athens to the Empire City of the South – Atlanta. Or maybe this time you’re driving down to Hilton Head to meet up with old buddies for the Memorial Day Weekend. We’ve all driven long distances – whether the short trek to your North Georgia lake house or a cross-country venture of Wyoming, there’s an unmistakeable feeling you can only get on the open road. You wave your hand out the open window. You scream aloud to the Neil Diamond blaring through your car speakers. Then it gets dark. You didn’t get your eight hours of sleep the night before. You’re running on fumes and so is your car. So you pull over to fuel up on gasoline and coffee. Only one more hour. I can make it. I won’t fall asleep at the wheel. I’d never let that happen. 96 fatal car crashes happen every year as a result of Americans falling asleep behind the wheel, which doesn’t even compare to the vast amount of accidents across the country caused by drowsy commuters and sleepy road trippers. The problem isn’t that we are all too tired. The problem is that we are ignorant of the real solutions that allow us to stay alert on those long nighttime drives down desolate country highways. Experts support short-term solutions, like caffeine, listening to music, or talking to a friend. But in the end, the true answer to this problem lies in getting a good night’s sleep before driving, stopping for breaks every two hours to stretch, and knowing when and where to stop for a nap. In steps Carffeine. Our mission is to educate and raise awareness about the dangers of drowsy driving by providing interactive resources and tools for drivers who may find themselves tired on the road. We hope to use technologies on data-driven smart phones to accomplish this mission. Using the mapping features available on these phones, we will help drivers find hotels, campsites and truck stops nearby where they can catch a safe nap. We will use Facebook’s Open Graph technology to link up commuters and drivers who are heading the same direction. 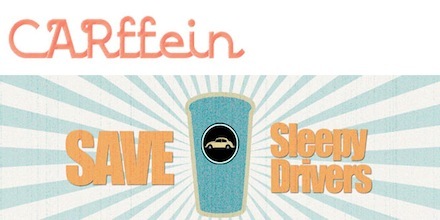 We will have a bank of resources, facts and tips to help drivers learn about the ways they can combat drowsiness. Finally we will use hands-free, interactive technology to allow drivers to focus on the road while listening to their music, to alert drivers in various increments with loud alert tones, and to remind drivers repeatedly of the various ways they can protect themselves against falling asleep behind the wheel. 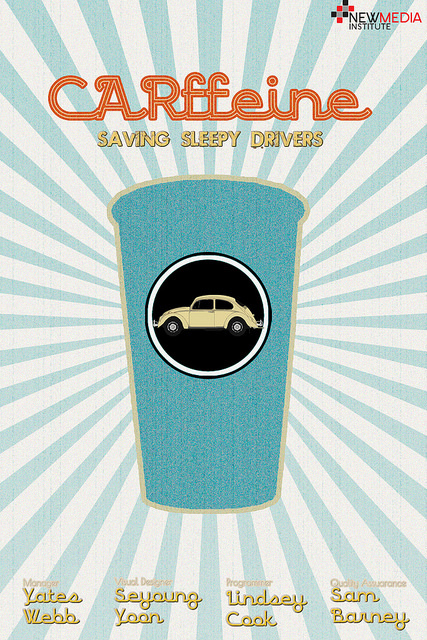 Through the years, advertising campaigns have attempted to alert the public of the dangers of drowsiness behind the wheel. But with new media technologies, we can reach drivers through the phones in their pockets rather than through the television screen in their living room. We all drive. We all get tired. Carffeine is here to make the roads we travel on safer places for all of us.